Children’s rights, in particular certain fundamental rights, are not sufficiently respected in Thailand, despite the adoption of numerous pieces of legislation. There is considerably less poverty in Thailand nowadays than in the past, with only 10% of the population living below the poverty line. Despite this low level, there are many families getting by on just the bare minimum. This situation means children cannot enjoy all their rights, such as the right to education or the right to health. The AIDS epidemic which raged during the 1990s led to a high transmission rate of the human immunodeficiency virus (HIV) from mothers to their children. This epidemic is the reason why many children are victims of AIDS today. Efforts have been made in providing information to mothers affected by AIDS and they receive medical care. The risk of transmitting AIDS today stands at 2%. Access to medical and psychological care must be improved, in order for children affected by HIV to reach a stable condition and to enable them to enjoy life. Today, although some 20,000 children are affected by the AIDS virus, only 1000 of these have access to medical and psychological care. Some children affected by the AIDS virus are treated with contempt, whether it be at school or within the family. They become weaker not only physically from the disease, but also psychologically because of how they are perceived by others. They are neglected and afraid of their family and friends. Furthermore, the child is ostracised by those around him or her once the virus has been diagnosed. Only psychological support from people they can trust will give them the hope of a happier and simpler life. There has been notable effort made in this field, with only 2% of children not attending school. Primary education is now free and compulsory. Those children not attending school mainly live far away from a school and do not have the means to get there by bus. Furthermore, immigrant children are sometimes unable to access education at all. They are very often banned from state schools and therefore have to resort to private schools. This therefore means that only those immigrants with a certain income can afford for their child to go to school. Children of poor families are the first victims when it comes to this issue. In these families, it is still the case today that parents send their child into prostitution in order to get by. These vulnerable children work both in brothels as well as on the streets, where sexual tourism is very prominent. Although the law prohibits and punishes these practices, there are still far too many children being forced to work. Furthermore, immigrant children are also forced to work. They are commonly found in the street selling anything they can find. 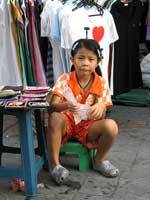 There are currently 20,000 children living on the streets in Thailand’s main cities. 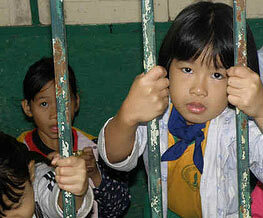 Many children in Thailand are victims of physical or sexual violence or abuse. Many of these cases are never reported as the children are afraid of reprisals and they still do not have access to the infrastructures to help them report this kind of violence. Generally speaking, these children are victims of abuse within the family or at school. Most instances of sexual violence are against young girls, which has a serious impact on their lives. They are vulnerable and do not dare to talk about the trauma they have been through. Also, some of them fall pregnant as a result of this sexual abuse, which turns their lives upside down. There are some organisations providing social services which welcome and support these children. However Thailand must do more to protect them. 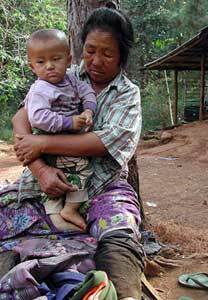 Thailand is next to Laos, which makes it an asylum destination for many Lao Hmong children. These children flee persecution in their own country in the hope of a better life, which turns out not to be the case when they arrive in Thailand. Once they arrive, they are detained by the authorities in filthy detention centres with little food and often suffer from dehydration. A significant proportion of these refugee children fall ill because of the difficult living conditions. Unfortunately, there are not many doctors allowed access to these centres. They children are therefore left to their own devices and their condition deteriorates day after day. A solution must therefore be found so they can once again enjoy their rights whether it be in Thailand or Laos. Arranged marriages still occur in Thailand today. Around 20% of women aged between 20 and 24 report that they were married by the age of 18. Marriages arranged by parents force young girls to marry a man they don’t necessarily love or know. Parents often choose a man from a more well-off family as the dowry system is still common. At the wedding, the future husband gives money to the young girl’s parents in exchange for her hand in marriage. These early marriages have serious repercussions for the health of young girls, particularly as they are not ready for pregnancy or childbirth.